I saw this fabric in a box and decided to cut a strip of it and try weaving it on my rug loom. It looked fantastic. So I cut a few more strips, wove them in and soon I was cutting 10 or 12 strips at a time, walking to the loom, weaving them in. It took no time to make this 24" x 44" rug. 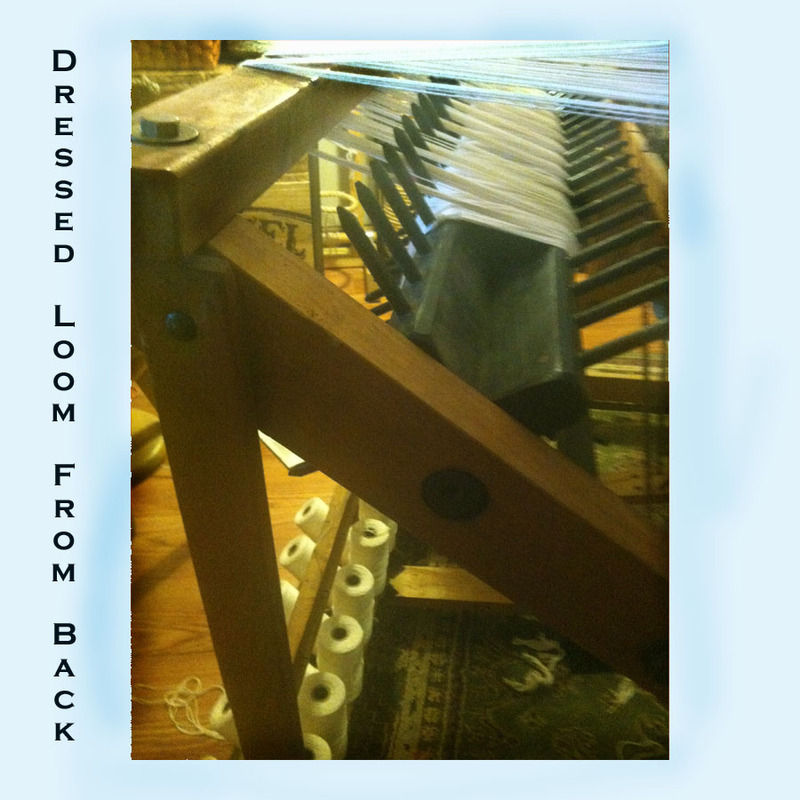 Of course the time consuming process of dressing (warping) my loom is not mentioned here. The colors on these photos changes because of lighting in my loom room. So I'd call the colors beige, light coral and gray. 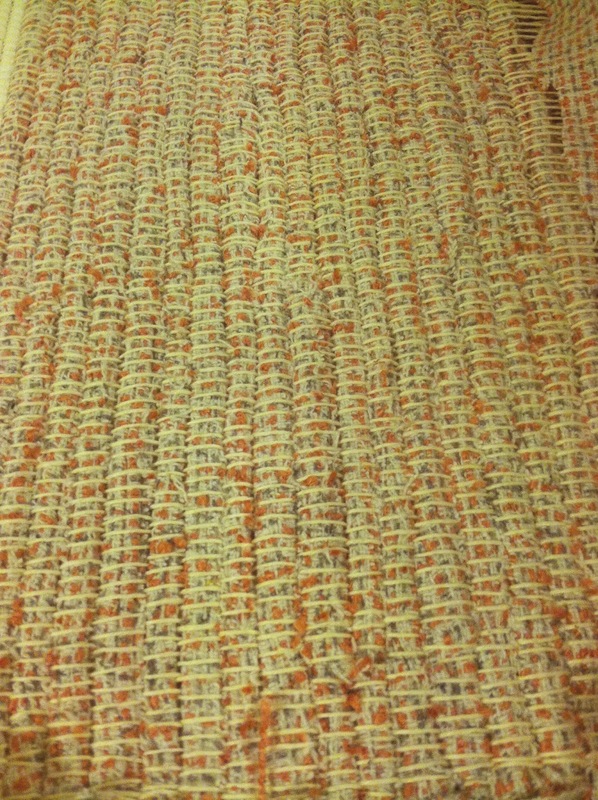 My starter weft threads are toilet paper strips, that's the white in the foreground (bottom) of picture. 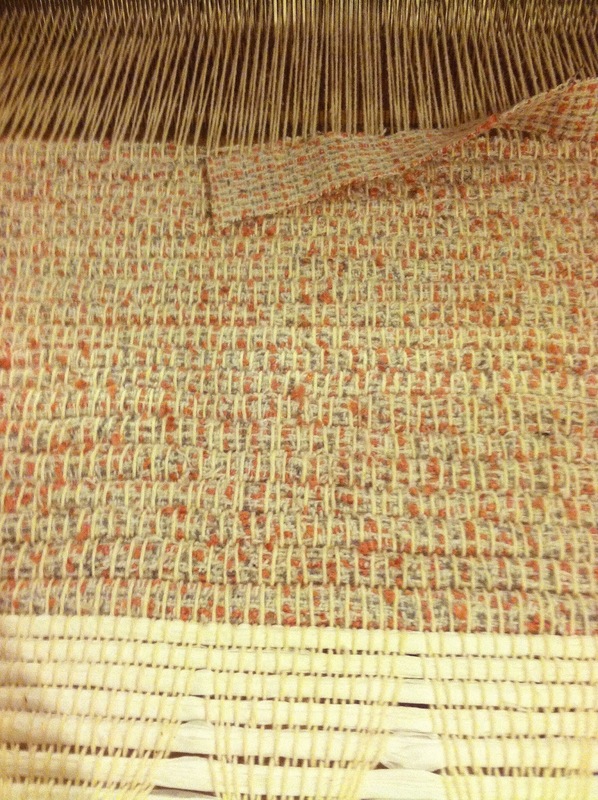 Great side view of item still on the loom. A work in progress, once I complete the fringe process I'll get a photo of the finished project. I do Crochet. Baby Christening Gown from YouTube Video. It was a Christening. I was asked to make her gown and hat. There will be better pictures. Here's the dress. It was 34" long, and size 9 months to 12 months. I made the entire dress from a YouTube video. And here's our sweet granddaughter in her dress and hat. The hat can be gathered by a ribbon and has the slightest brim in front. 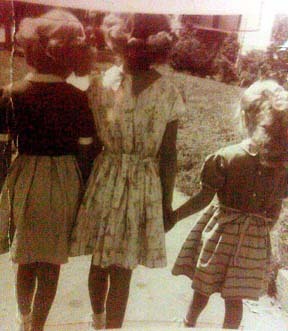 The dress has a ribbon around the bodice, and can be gathered if needed. I'll post other pictures as they are received. She was perplexed by all the excitement at church. She's almost 7 months here. When I was given this Union Loom 36 I had no idea I would be able to leave the warp on the loom and weave more than one rug. I was used to dressing the loom for one specific piece and having to start the dressing process again after that piece was removed. 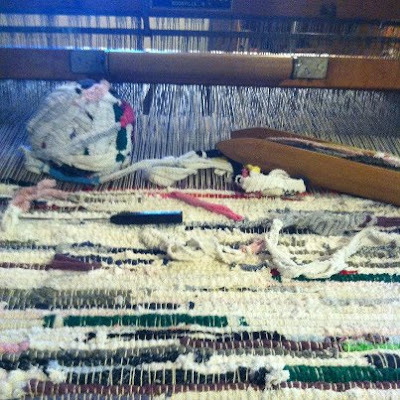 Strands of warp thread moving through the heddles (needles) and then through the reed are each individually warped to a board at the back. I warped 20 yards for this project, and proabably used 2 MAX!! 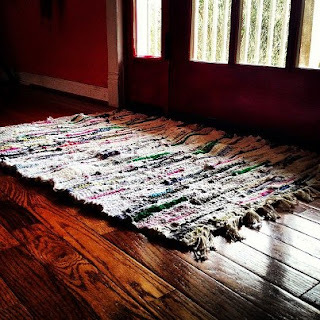 The finished rug is 26" by 50" about a 2' by 4' rug with short fringe. I couldn't for the life of me figure out what these loops of fabric were made from, until I did a ton of research on rag rugs online. 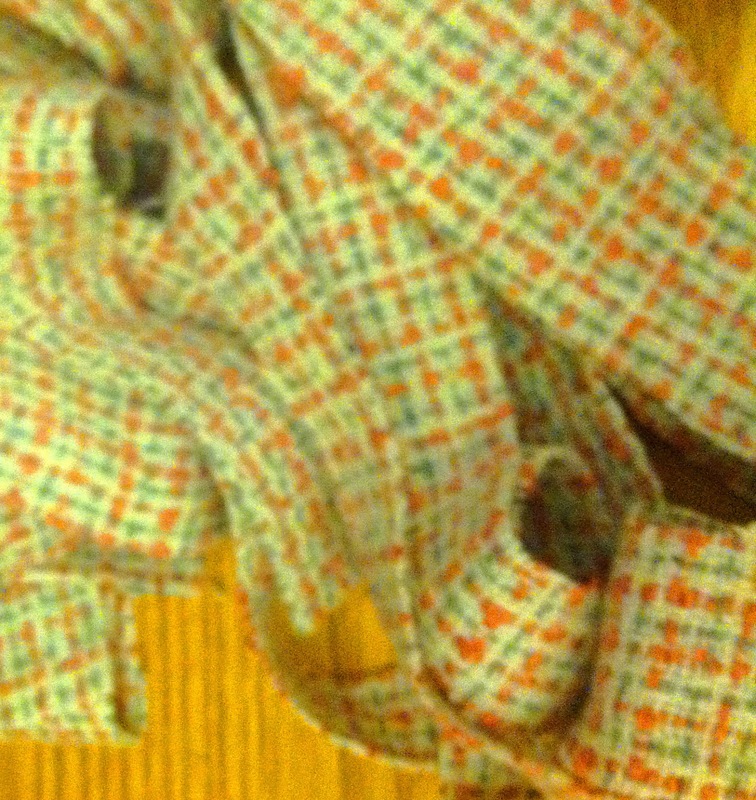 Finally I realized that it is mostly socks, cut in strips making loops. 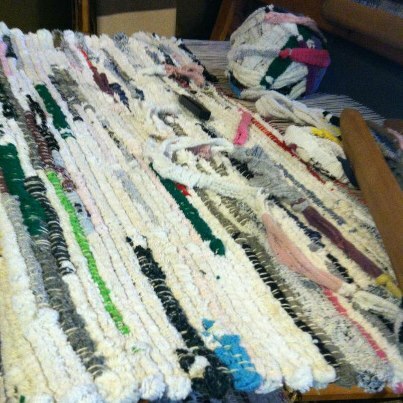 Maybe some shirts and some robe sleeves, because there seems to be a lot of chenille wrapped into this ball of scraps. Below is a picture of the finished rug that I gifted the people who gave me the loom. Frankie and Rebekah's rug by the door. You can read more about setting up a weaving area and my first loom and projects here. Boo, our 45th wedding anniversary gift to ourselves. She has on a "felted" cashmere sweater sleeve, with little holes cut on the sides for her legs. She is so cold in the mornings, she lays in the sun in her sweater, on her blanket. Too funny how many little habits she has already. To the left is a picture of her the first week we had her, that is a 12" tile in a back yard. And below is a picture of her with another felted wool sweater sleeve, the rounded section down her back is the upper sleeve where it sets in at the shoulders. I just hold it up to her tummy to determine where to cut holes for the sleeves. A felted wool sweater cuts without fraying. She practically climbs into her sweater in the mornings, she's shaking so bad on her first AM outings. I've collected several FREE on-line knitting patterns and written about the results with lots of pictures in this article. 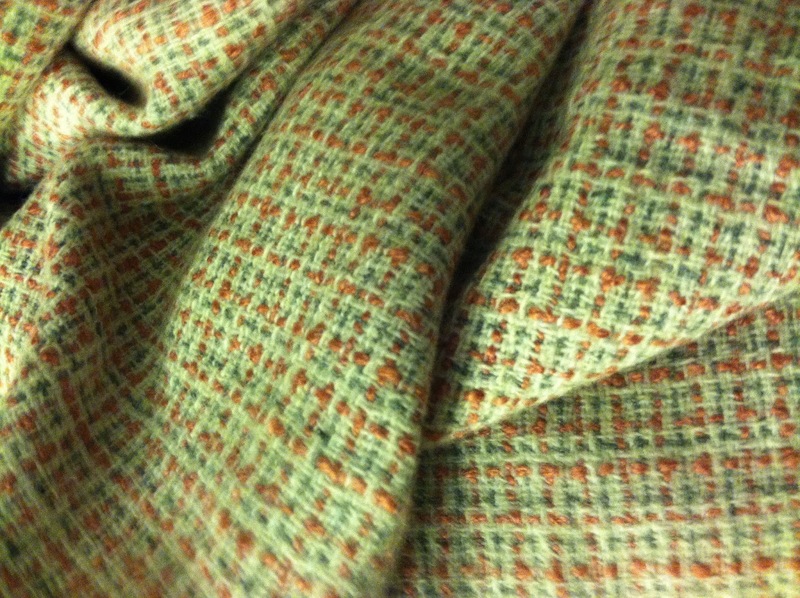 Read a review of patterns I've used. View pictures of many items I've made. Find resources for FREE patterns. When you go to the article, please click on LIKE if you like it, as I'm rated for the quality of the article by the number of LIKES I get and a half-dozen other reasons. You can write original content on Squidoo, too. I got started writing on Squidoo in April 2011. I have 77 articles that are published. I started with a "bucket-list" of topics that I hoped to complete in my lifetime, I've accomplished many. My goal is to have 100 articles by the end of 2012. Several have a knitting theme, but most are about life and experiences along the journey. You can buy this poster. Begin selling my artwork online at Zazzle. Yarns that I use to felt. Get them on Amazon. Looking for my post about the 1950's Skates? One of my knit felted purses, custom ordered. Almost finished with needle felting the Rose. Knit felt baby booties from Baby Drops. My YouTube Video is about to hit 16,000 hits! Check out this yarn shop online. A Baby Sweater I made in '09.